Combine flour, salt and sugar in a bowl. Add butter and either using a stand mixer with a paddle attachment or a handheld pastry blender, mix until mixture resembles coarse sand. In a small bowl, add the vinegar to the ice water. Gradually, add ice water mixture to the flour and butter mixture, mixing in between additions. Add the water until the dough forms a ball. The dough should not be sticky or crumbly. Wrap the dough in plastic wrap and keep in the fridge for at least 30 minutes. On a lightly floured surface, roll out dough until approximately 9″ in diameter. Gently place the dough into an 8” pie plate. Crack the egg and separate the yolk and the whites. Use a pastry brush and gently brush a thin layer of egg white onto the bottom of the dough. This will create a barrier between the filling and the piecrust as it bakes. Place in the fridge for 30 minutes. Meanwhile prepare the filling. Combine all filling ingredients, except the bacon, together in a mixing bowl. Preheat oven to 425 F. Toss until the apple slices are coated evenly with the juice, sugars, cornstarch and spices. Place the filling into the prepared pie plate. 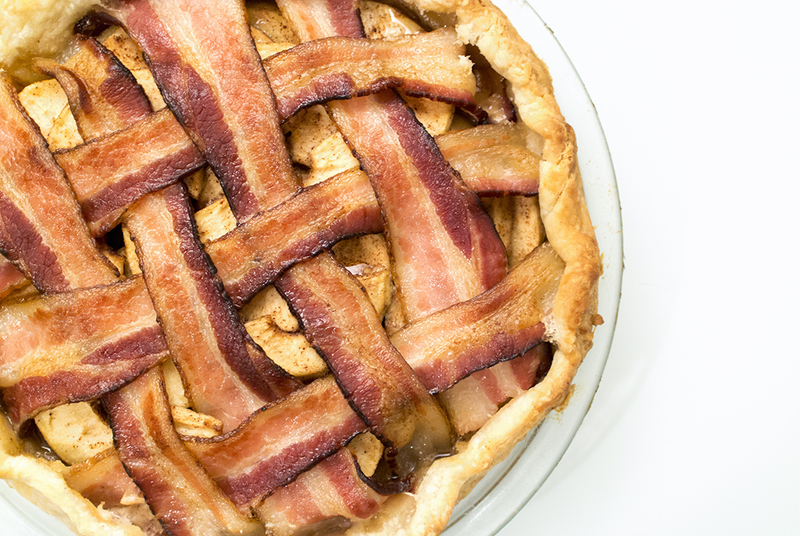 Place half bacon strips horizontally onto the pie. Place the remaining bacon strips one-by-one vertically, lifting every other strip to create a lattice pattern. Crimp the edges of the pie, tucking in the ends of the bacon slices as you crimp the edges. Lightly beat the remaining egg yolk and brush gently onto exposed edges of the piecrust. Place the pie in the fridge for 20 minutes to allow the pastry to set. Bake pie for 20 minutes. Rotate, lower oven temperature to 375 F and bake for another 30 minutes or until the crust is golden brown. Cover edges with folk if they brown too quickly. Let cool for 1-2 hours. A few notes on preparation: I used Granny Smith apples. I don’t have an 8″ pie plate, so I used a 9″ plate and made a 1.5 recipe of dough. Five apples were more than enough for a 9″ plate (actually had too much). We didn’t have enough bacon strips, so we only used 7 strips instead of 8. It turned out to be a delightful pie! The filling set up nicely, and the bacon-lattice top is certainly eye-catching. The relative sweetness of the apples against the salty bacon topping made for a fun juxtaposition. D noted that he could’ve had the bacon be a tiny bit crispier and the filling perhaps a bit less sweet, though I personally enjoyed the sweetness level. It did also make for a delicious breakfast the next morning. One to certainly come back to!